Last night, I shot the above picture, which went far more viral than anything I’ve ever posted to Twitter. I shot it while spending the early part of the evening covering a pro-police “Thank You NYPD” rally at New York’s City Hall. From the advance publicity, it seemed like the kind of event which could quickly devolve into a pro police-state rally, the kind of affair which would doubtlessly draw one of the city’s nightly anti-police brutality rallies (which have been occurring since NYPD Officer Daniel Pantaleo was not indicted for the death of Eric Garner) into a confrontation. Which was precisely why I wanted to go. Not only would it be a great place to listen to the protestors I’ve been covering for my column, it would also be a great place to hear from those who think the police have been taking too much heat. I called up Whitney Dow, the director of the Whiteness Project, to go with me. We met when I interviewed him for the Guardian about his fascinating POV interview project on white identity, and we have been conversing about how white people perceive their own race ever since. I knew he might be able to connect with the pro-NYPD demonstrators in a way I, as a black/ mixed race interviewer could not. Outside City Hall, the pro-police side only had a handful of demonstrators, and were always outnumbered by several factors by the well organized anti-police brutality side. The theater of the whole scene was comically absurd, given that the NYPD — the organization feared by one side, and defended by the other — tried to maintain control over the scene by separating the two sides with barriers. The pro-side then appeared bigger than it was because most journalists and researchers, including me, went to that side. 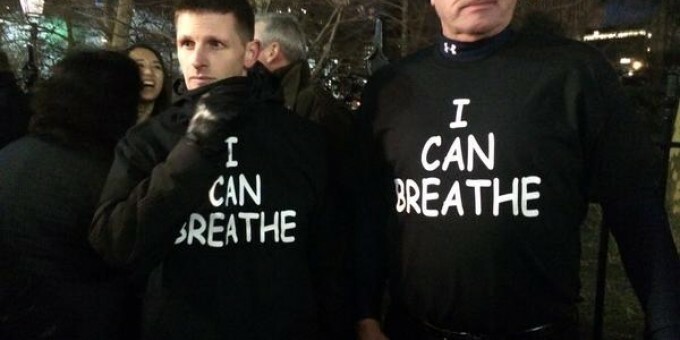 That was where the story was of the kinds of people who were wearing “I Can Breathe” T-shirts, mocking Garner’s final words. 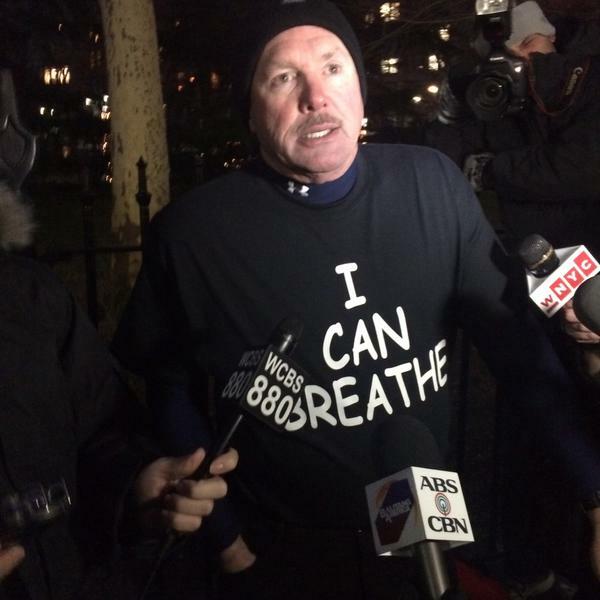 The shirts were made by the man in the above picture, who traveled all the way from Colorado to show his solidarity with the police officers, after reading about it in the New York Post. As a reporter, I’ve often assumed there is limited value in covering such events. The whole thing is a spectacle, often with people who come out simply to get time in the media. Yet the theater itself can be revealing, and the mechanics of the staged protest informative. For example, there were probably not more than 200 protesters, counter protestors, media and cops combined on the ground, yet the NYPD appeared to have two helicopters flying overhead. I was most scared when I got a retired, large white cop to talk to me. He was trying to convince me that Eric Garner should have known how to submit, because he’d been arrested so often. The man put his hands on me to demonstrate what a chokehold was, and what it was not. I hoped Whitney Dow and CS Muncy, another white journalist friend of mine standing nearby, would step in if anything happened. But I momentarily thought I would panic, and my heart raced. Here I was, being “protected” by the NYPD on duty, surrounded by angry, white, retired and off-duty cops and their supporters. Who hated the press and, it seemed, Black people — and I was in the middle of them. I wanted them to talk, and I wanted to hear what they had to say, so I didn’t say much back, even to the man trying to convince me that if Garner had been pliant enough, he wouldn’t have died. I just try to keep people talking in these situations. Whitney could do it a little easier here, because at least he’s White. Sometimes my fear gets the better of me. Sometimes, I worry about walking the line between trying to give visual cues that I am hearing someone (no matter how offensive) and not being willing to give them any indication that I agree with anything they say. I wonder, as I transition from doing interviews for print and radio journalism and into doing interviews for ethnography and social science research, whether this will get harder or easier. Especially, as I’ve found in a decade of interviewing people for media, that those with the most offensive things to say are usually the most aggressive about trying to elicit cues of agreement. None of this is easy. On evenings like tonight, it’s downright terrifying. Steven W. Thrasher, a weekly columnist for the Guardian and Contexts board member, is in the American Studies program at NYU. Follow him on Twitter @thrasherxy. pro-tip: If you're going to be an insensitive bigot with zero integrity, comic sans is the best way to go! The great unspoken truth here is that police, and society largely, actually walk through life with the thought that policemen are "good", that they are self-existing goodness by virtue of what they do for a paycheck. America is in love with large government power. We conduct our whole nation with the assumption of the ultimate good of the law and its priests on the streets. Anything short of worship, and God help you if you disagree, is blasphemy. 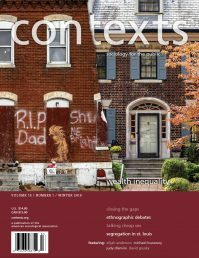 Why we remain oblivious is only explained by hatred of our neighbor and our equally assumed moral superiority to people of color and the poor. We have seen this so many times in history in various packages. We are no better. In fact, we are worse. This article is extremely biased. You scorn the pro police protesters for judging your opinion based on color but you also confirm that they were right in the assumption even if they were over aggressive in calling you out. You write how you're terrified of the guy touching you even though he is a retired public servant surrounded by current public servants. You demonize those who support the people who risk their lives every day while their demonstration from your account was no more radical than the opposing ones which occur every single night to criticize those same life-riskinf public servants. White supremacy in 2014 is the hyperbole of a small lasting phenomenon perpetuated by white guilt and insecurity. You codnlu't pay me to ignore these posts!